Cho U wins Meijin title: This year’s Meijin title match not only when the full distance, but was also decided late in the second day of a two-day game. The challenger Cho U won back a title that he had lost to Iyama Yuta ten years ago. The seventh game of the 43rd title match was held at the Imai Inn in the town of Kawazu in Shizuoka Prefecture on November 1 and 2. 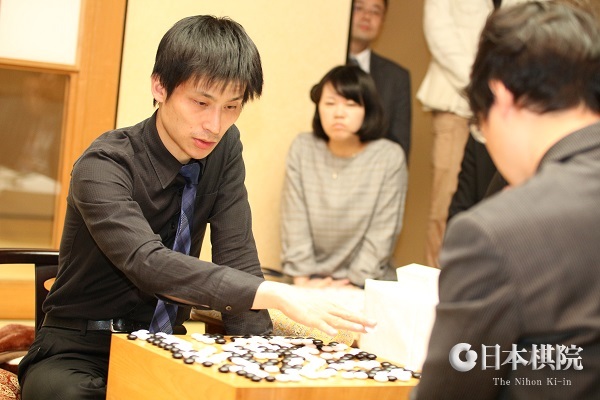 Since it was the seventh game, the nigiri was held again and Iyama Yuta Meijin drew black. From the outset, Iyama went for territory, so naturally Cho built thickness. With three very bold moves from 60 to 64, Cho sketched out a large center moyo. The major part of the game consisted of the fight started when Black tried to cut back the potential of the moyo. After Black lived with his invading group, the position seemed a little favorable for Black, and the players following the game in the pressroom thought that Iyama might have defended his title, though the game was very close. However, Iyama made a mistake in the endgame with move 167, letting White set up a ko that Black didn’t have enough ko threats to win. This decided the game, with White winning by 4.5 points. At his peak in the late 2000s, Cho dominated the go scene in Japan, becoming the first player to win five of the top-seven titles in 2009 (they were the Meijin, Tengen, Oza, Gosei, and Judan). In 2010, he also became the second player after Cho Chikun to complete a cumulative grand slam. However, his last top-seven titles were the Kisei and Judan in 2012; thereafter, he was eclipsed by the reign of Iyama. He has now made a comeback at the age of 38. The Meijin prize is 31 million yen (about $282,000) (reduced from 33 million last year and, if my memory is correct, from 35 million earlier). This is his fifth Meijin title and his 40thtitle overall. Iyama has been reduced to a quintuple crown for the first time since November 2015. Young players share lead in Honinbo League: The first two games in the second round of the 74th Honinbo League were played on November 1. Ichiriki Ryo 8P (W) beat Yamashita Keigo 9P by resig. and Shibano Toramaru 7P (B) beat Anzai Nobuaki 7P, also by resig. On 2-0, they are the front-runners, though it may be a little early to be talking about the lead. They play each other in the fourth round in January. Choi Jeong wins Bingsheng Cup: In full, this tournament is called the Qionglong Mountain Bingsheng Cup World Women’s Go Tournament. This year it was held for the ninth time. As the sponsoring country, China had six players to three each for Korea and Japan, but the Koreans dominated the tournament. Judging by recent results, the Koreans, led by Choi Jeong, seem to be the strongest women players in the world. 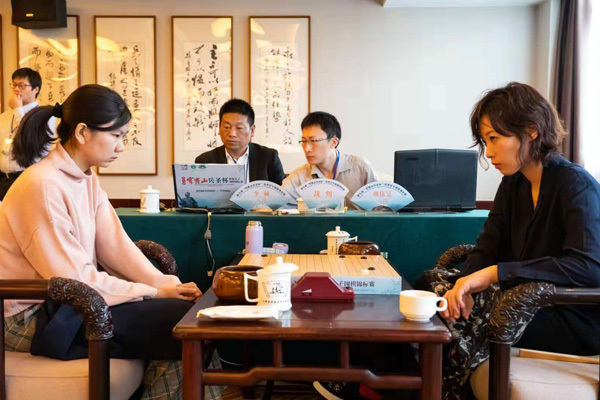 First prize is 300,000 yuan (about $43,000) and the time allowance is two hours per player, with the last five minutes going to one-minute byo-yomi. Komi is 7.5. Below are full results. Incidentally, in this tournament the key to winning seemed to be drawing black: white won only three out of 15 games. Round 1 (Oct. 31). Zhou Hongyu 4P (China) (W) beat Fujisawa Rina 4P (Japan) by resig. ; Oh Jeongah 3P (Korea) (B) beat Ueno Asami 2P (Japan) by resig. ; Lu Minquan 5P (China) (B) beat Stephanie Yin 1P (US) by resig. ; Hei Jiajia 7P (Oceania, also known as Joanne Missingham) (B) beat Natalia Kovaleva 6D (Russia) by 21.5 points; Oh Yujin 6P (Korea) (B) beat Wang Chenxing 5P (China) by resig. ; Yang Zixuan 2P (Chinese Taipei) (W) beat Gao Xing 4P (China) by resig. ; Choi Jeong 9P (Korea) (B) beat Yu Zhiying 6P (China) by resig. ; Xie Yimin 6P (Japan, right) (B) beat Li He 5P (China) by resig. Quarterfinals (Nov. 1). Oh Yujin (W) beat Lu by resig. ; Choi (B) beat Zhou by resig. ; Hei (B) beat Xie by 1.5 points; Oh Jeongah (B) beat Yang by resig. (Semifinals, Nov. 2). Choi (B) beat Hei by resig. ; Oh Yujin (B) beat Oh by resig. (Final, Nov. 2). Choi (B) beat Oh by resig.